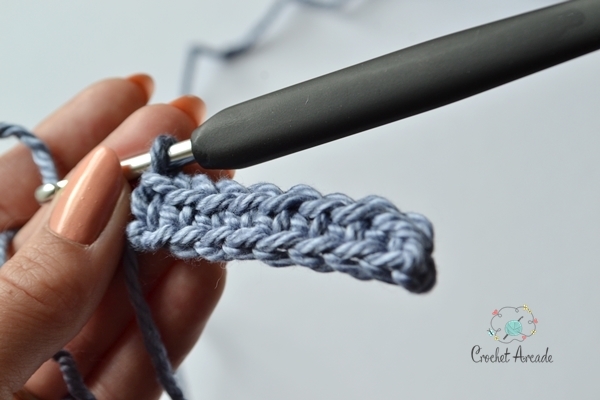 Would you like your crochet fabric to be exactly the same at the top as it is at the bottom like on the photo above? 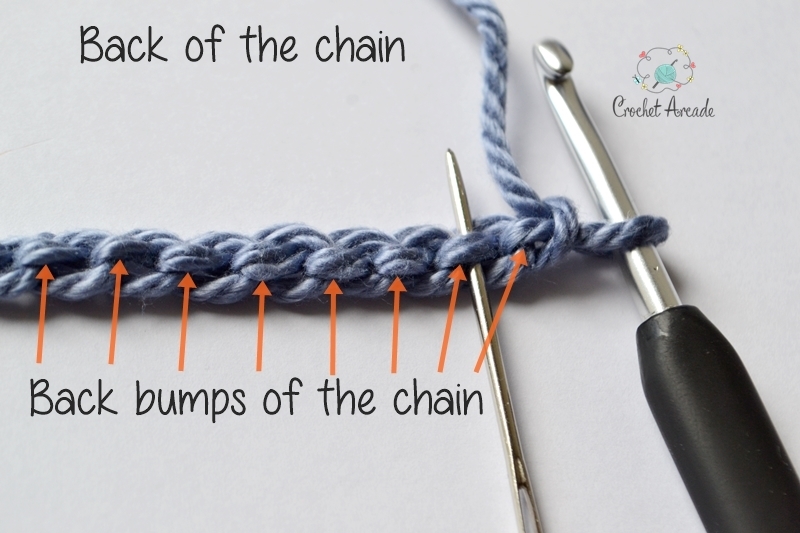 There is a way to achieve it by crocheting in the back bumps of the foundation (starting) chain. This method not only gives you a nicer and neater finish but also adds the strength to the bottom of your work. Let’s find those back bumps then! 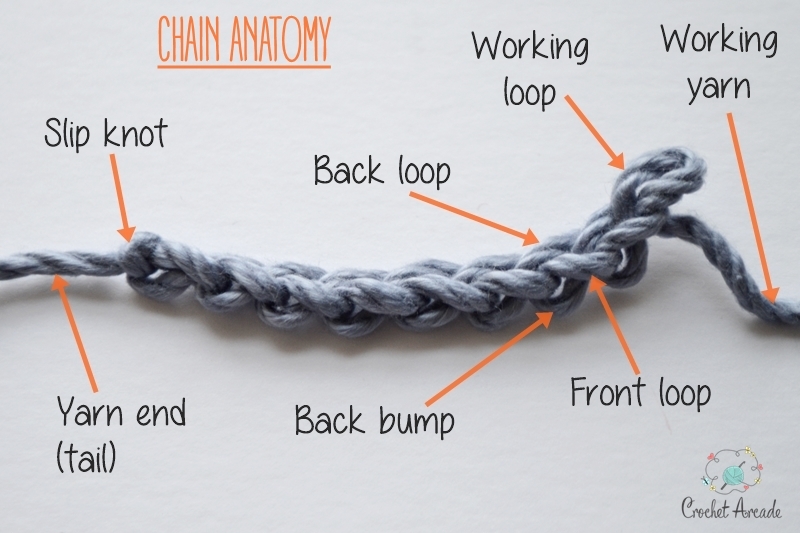 Have a look at the photo below showing the chain anatomy (side view, 8 chains). 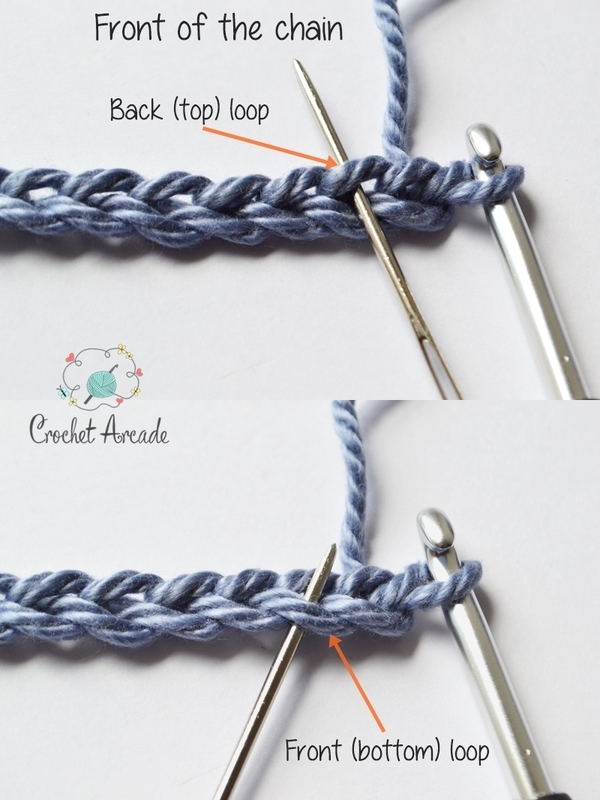 In the traditional method you are told to make all your stitches in the back (top) loops of foundation chain only leaving the front (bottom) loops and back bumps out (see the photos below). Now turn the chain up side down to examine the back of the foundation (starting) chain. That’s where the back bumps are and that’s the position to hold your chain when working in back bumps only. We’ve located the back bumps of the chain so let’s proceed to make crochet stitches. 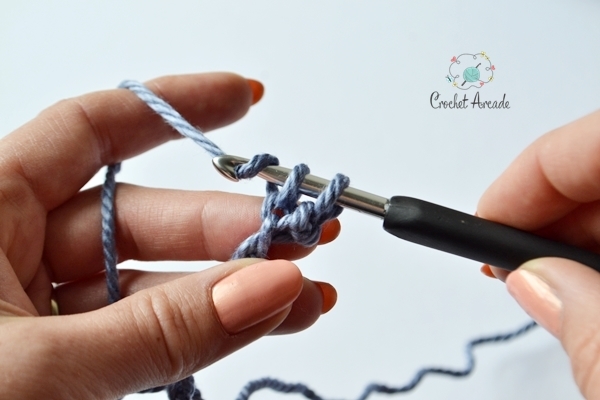 Crochet the same way as you would normally do so if you want to make Single Crochet (US) – Double Crochet (UK) then work your first stitch in second bump (that’s where the needle is at the above photo). 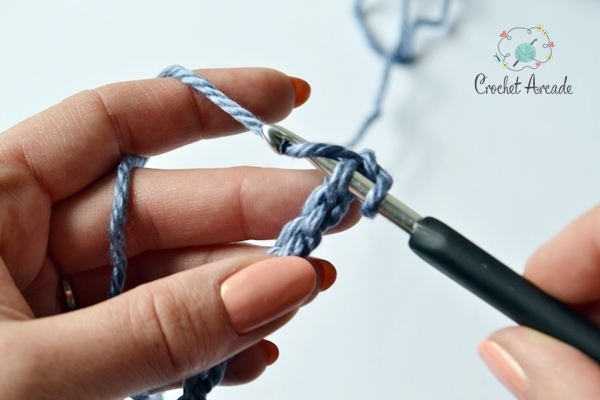 For Half Double Crochet (US) – Half Treble (UK) skip 2 bumps and make your first stitch in the 3rd bump and for Double Crochet (US) – Treble (UK) skip 3 bumps and start working stitches from the 4th bump and so on. 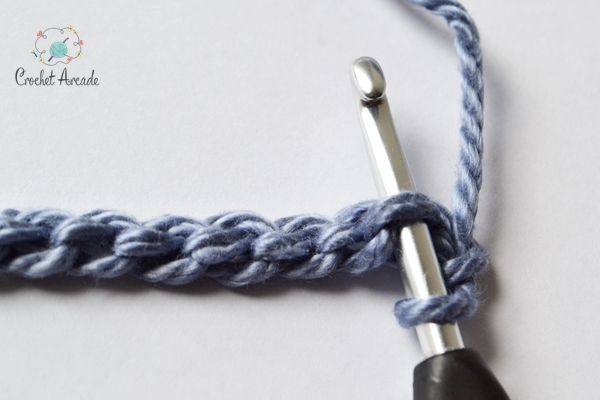 In the example below I’ve made a row of Single Crochet (US) – Double Crochet (UK). Step 1 – Insert the hook in second bump from the hook. Step 2 – Yarn Over (YO) and pull through the bump. 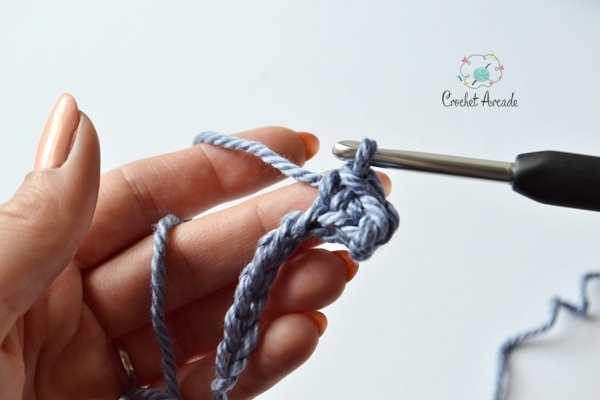 Step 3 – You should have 2 loops on your hook. 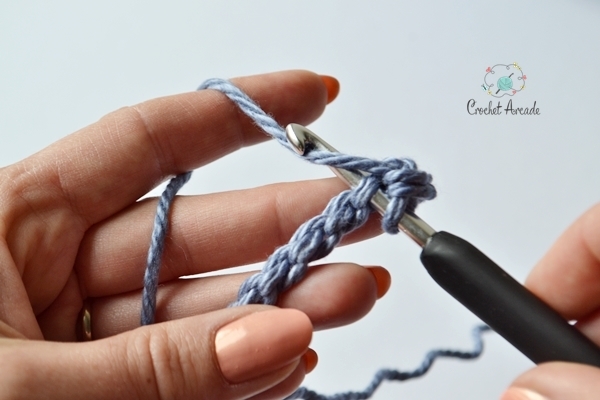 Yarn Over (YO) again and pull through 2 remaining loops on your hook. That’s first Single Crochet (US) – Double Crochet (UK) finished. 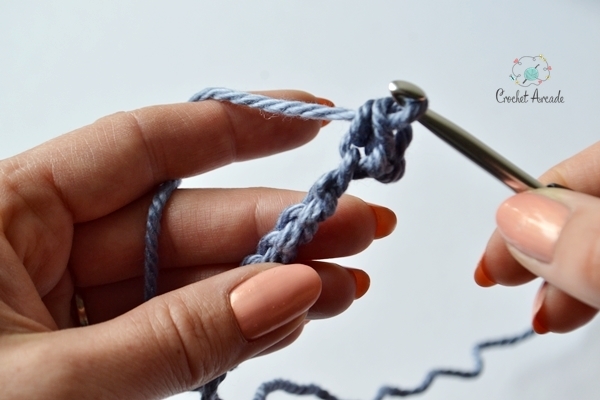 Proceed to make another Single Crochet (US) – Double Crochet (UK) and repeat to the end of the chain. That’s your first row finished. The bottom of the row looks exactly the same as the top of the stitch. How neat!